Welcome to Hampton Inn Events in Saint Robert. Our space is located a stone’s throw from Fort Leonard Wood in the rolling hills of south central Missouri. The Hampton Inn is honored to host a myriad of functions. Our inviting, nature inspired space with an open floor plan allows for several seating layouts and makes it an ideal venue for any occasion. We combine creativity with experience to produce a unique atmosphere just for your event. We make booking with us an easy choice with our complimentary fine china, stemware, overhead sound system, and state-of-the-art presentation equipment. Set-up, clean up, and extensive event planning are also included. Coordinating your function a breeze. All you do is arrive. Your Special Event is our Priority. Ensuring our guests are happy and that every detail of their event taken care of is paramount to us here at the Hampton Inn in Saint Robert. We maintain high standards of customer care. Over the years, we have been honored to host nearly every kind of event imaginable making us equipped and ready to assist you with yours. 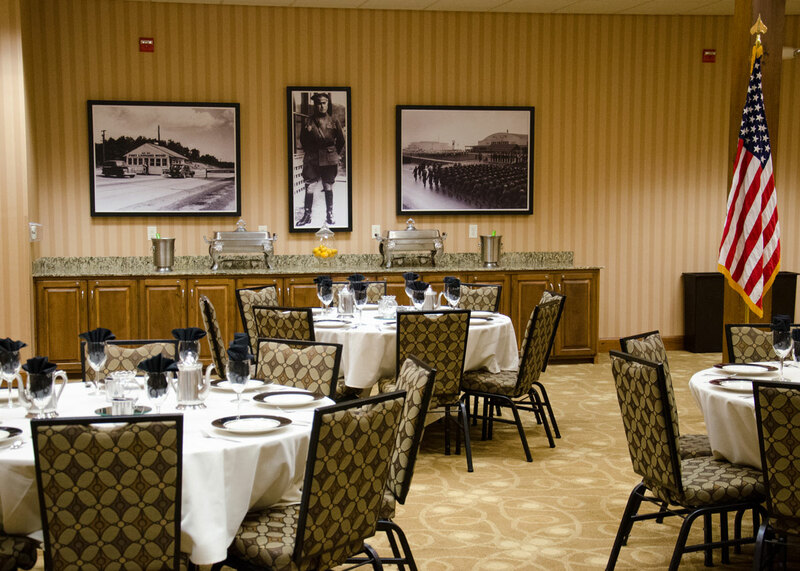 Contact us today to inquire about hosting your special occasion at the Hampton Inn or to schedule a private viewing of the space and private lower lobby and entrance. Our event space comes complete with round tables, rectangular tables, overstuffed backed chairs, beautiful granite counter space over hardwood cabinets, installed overhead sound system, large windows spanning the length of the far wall, black and white historical photographs, stainless steal serving-ware, ivory and gold dinner ware, silverware, linens (rental fee), small commercial kitchen, and garbage receptacles. Our facility can host small events (12 people or less) up to larger functions (120 to 150 people) depending on setup style. We have several complimentary amenities and event supplies to give your event a touch of elegance including fine china, stemware, water glasses and stainless steal serving-ware. When you are at the Hampton, all you do is arrive. Set-up, tear-down, and clean up services are included in the rental cost. Click to view a sketch of our facility. Whether you are heavily involved in the details or the carefree, whimsical type, we have just the right support available for you. We are prepared to handle everything: from event design to space planning, from booking the caterer to adding special touches to the place settings. Adding that tasteful touch of catering, music and flowers makes your guests feel welcomed and comfortable. Whether it is a wedding reception, reunion or corporate affair, ask us about our vendor partners ready to help make sure your event is perfect for you and your group. Our event coordinator is prepared to plan as many details of your event as you like, making the process of piecing your function together simple. When you book your next special occasion at the Hampton Inn in Saint Robert, you get the full support of having your own event coordinator available during your event to handle all the details or attend to anything unexpected. In order to create the best atmosphere at your event, we have partnered with several vendors in the local area to provide a full service experience. As a guest of the Event Space, you have an excellent resource, allowing you to choose the very best for your occasion. There are planning and rehearsal times available. Contact the hotel event coordinator to schedule yours.